What does a movie about a famous rapper and a movie about the Holocaust have in common? Other than the fact that they’re based on true stories, not a thing. So why review them together? Both films are entertaining, well-done, and weightless as air. You won’t remember, or care to remember, a single thing you saw about them once you left the theatre. But you will enjoy your time while you’re there. Notorious is based on the all-too-short life of famed rapper The Notorious B.I.G. aka Biggie Smalls. The film accurately captures the rugged drug life in late-‘80s Brooklyn and is superbly acted, namely by newcomer Jamal Woodlard in the title role, but it’s nowhere near as hot as its booming soundtrack. 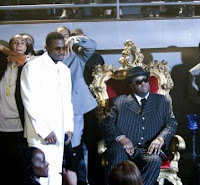 We watch Biggie as he goes from rags (freestyle rapping on the streets between crack deals) to riches (becoming a musical icon at the helm of ambitious producer Sean ‘Puffy’ Combs), but the meat of the film is pretty dull. The movie adds nothing new to the music bio-pic. Biggie is an adulterer! He yells! Screams! Punches walls! Treats women like objects! And so on. As Tupac Shakur, actor Anthony Mackie brings his reliable intensity to a man who was known for his not-so-nice temper. I didn’t mind the time I spent in the theatre, but I constantly wanted more. The same can be said for Defiance a true story about three Jewish brothers during WWII that hide out in the woods from the Nazis. Slowly, more and more Jews are showing up in the woods, before long we have an entire community to keep up with. The problem of the film is its predictability. I mean, do they really think they can hide out forever? Daniel Craig is good as the lead, but the material is weak. Credit director Edward Zwick (Glory, The Last Samurai, Blood Diamond) for the thrilling, but overlong, battle scenes. Again, this is a film that will keep your attention throughout its duration, but not too much after. If it’s a bio-pic you want, I suggest Milk, a Holocaust drama, check out The Reader. Defiance was fine, but if Daniel Craig hadn't been in it, then I think you're right, as there isn't really anything else I can remember about it. Wow, Defiance, haven't thought about that film since I wrote this review. I honestly remember next to nothing about it. Oh well!